“The Evangelical Voice for Today,” features hard-hitting stories about the world around us from an evangelical Christian perspective. Get monthly commentary from Franklin Graham, plus news, relevant interviews, biblical teaching, ministry updates and more. Invest in encouragement. 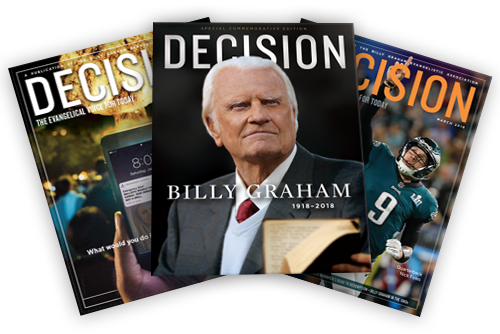 Get your own subscription, or renewal, or bless someone by giving Decision Magazine as a gift. BGEA Resources, P.O. Box 668886, Charlotte, NC 28266-8886.